Today, digital transformation for retail organizations is an absolute necessity. With growing mobile phone dependent consumers and modern customers preferring online shopping, a retailer needs to upgrade and cater to each type of customer with the same level of user experience. Be it any small firm or a large enterprise, every retailer now understands to look beyond marginal enhancements and wants to implement advanced digital processes. With the rules of the game changing, retailers need to rethink every aspect of their business. These include pricing strategies, customer experiences, inventory management, branding & marketing, accounting and much more. All these transformation strategies focuses on one single thing: Customer-centricity. The ultimate test for any retailer is to consistently provide a customer experience better than any of its competitors. To improve and provide the best customer experience, every process needs to be streamlined and productive strategies implemented at each stage by the firm’s workforce. This also depends heavily on empowering your employees with state of the art tools that help them to coordinate and communicate with each other. A company which does not focus on efficient employee communication eventually loses out on providing their customers best services, despite having better product features. This holds true for small enterprises like a food truck or a large online e-commerce retailer. The key to great customer experience is a well connected and informed employee workforce that is dedicated to provide optimal services. For the retail industry, large quantities of messages must be sent and received within different departments and teams to get the latest information available. Internally, team members need a way to quickly consult each other on various issues. The speed and responsiveness of communication is also a major factor and waiting for email responses just doesn’t work. This emphasizes the need for retail firms to provide a structured and swift internal communication approach for their teams in order to create easy and efficient collaboration. Office Chat team-based groups can help you to create and open lines of communication for specific client-based groups to communicate seamlessly and share ideas and documents within the group. This will help improve team communication at work and will also enable them to work towards the larger collective goal. The Private Chats featured within Office Chat will encourage users to interact with colleagues and peers with ease. Managers and supervisors can communicate necessary requirements and feedback with others. One-on-one Private Chats enable more transparency and promote open communication within the company. Employers use technological advancements to wow their customers, but somehow technology and its benefits seem to elude their workforce. This includes traditional emails, internal communication via obsolete software, stale intranet platforms, etc. This outdated infrastructure transports your new age employees decades back each single work day. Employers who are reluctant to implement new means of communication in their workplace risk reducing their employees’ productivity. They should try and replicate successful current trends that their employees have become used to. With over 60 billion smartphone users estimated by 2020, one way employers can change their culture is to enable smartphone technology at their workplace. Using a secure business communication messenger such as Office Chat on smartphones can help make communication easy. With Office Chat, employees feel connected and much more informed. Employers can be assured that their confidential data remains secured. Various mobile teams such as sales, support, etc. can respond quickly to any updates. 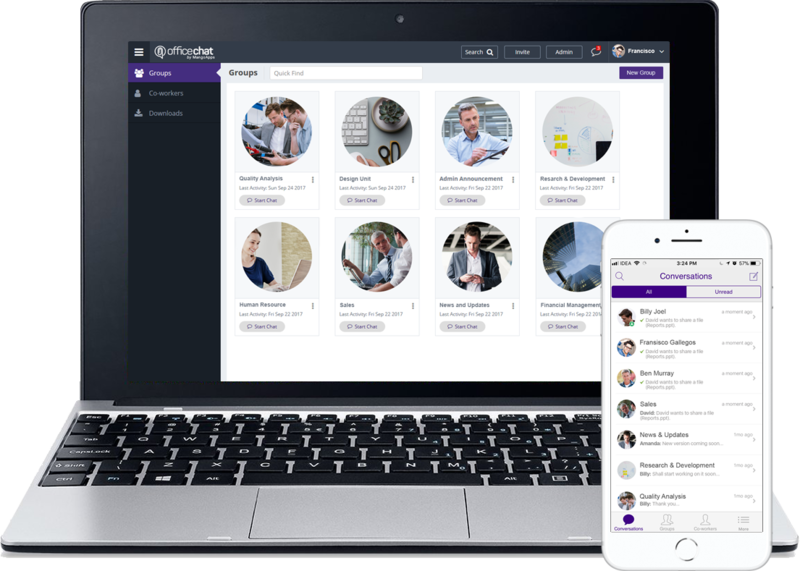 Office Chat works seamlessly on multiple platforms such as desktop apps (Windows & Mac), smartphones (Android & iPhone) and web browsers to ensure that your in-the-field, office-based or remote workforce stays connected. Technological advancement has given new age retailers an edge over traditional retailers. As opposed to traditional retail firms that have stipulated working hours, these retailers can cater to their clients much more effectively using Office Chat. With Office Chat you can enable flexibility and accountability of your employees all the while boosting the productivity of your firm. You can easily reach out to remote employees by ensuring high accessibility from multiple Office Chat platforms such as desktop, smartphone and web browser. You can use the Online Presence, Custom Status and Huddle features to stay connected with your team. Messages, files, groups and people can be easily searched within Office Chat. Despite any difference in time zones, your employees will have real-time flexibility that is not provided by emails. The Office Chat 1-to-1 Video , Voice Call and Screen Sharing feature helps you to conduct team meetings. You can invite essential people only, set an agenda, end meetings on time and appoint presenters to keep the discussion focused during the meeting. One of the main challenges facing employees in the modern workplace is sharing the latest information and sharing data files securely. Office Chat not only gives you the option to send text messages, but you can also share documents, videos and more. Upload files, images and video (any size up to 2 GB) in any conversation. Sharing images, videos, audio and GIFs is as easy as selecting the appropriate icon. With Office Chat, you can simply drag and drop attachments and files. With over 100 GB of file storage and features to search chat history and even file contents. Thus you can easily share relevant files and attachments with your colleagues and managers. Most organizations use multiple applications to fit their business needs such as Zendesk, Mail Chimp, etc. These applications often require a simple integration mechanism to work in sync with other business applications. Without a single platform to easily integrate multiple apps, the productivity of the workforce is hampered. And they are forced switch between multiple applications and find workarounds to sync their work. Office Chat helps you integrate with third-party applications such as Zendesk, Pingdom, Beanstalk, Mail Chimp, etc. You can conduct video conferencing using inbuilt 1-to-1 Video, Voice Call, Screen sharing feature or using GoToMeeting/JoinMe. You can also sign in to your Office Chat account using your Google Apps account or Active Directory. These integrations will automatically let you pull information and activity from an external system into Office Chat in a way that’s timely, relevant and searchable. Today with cyber-security threats, extra steps should be taken to protect sensitive data. Office Chat delivers proactive security, control and IT compliance over your company’s data. All messages exchanged and files shared on Office Chat are encrypted in transit (TLS/SSL) and at rest (256-bit AES encryption). With custom data retention and deletion rules, the admins of your company control how long you want your data stored. Remote device management can be used to disable or wipeout downloaded Office Chat content on mobile devices. Two-factor authentication (2FA) security drastically reduces the risk of online identity theft. User and access management can easily add, remove or investigate users through the admin portal. Office Chat runs on AWS cloud which delivers end-to-end, enterprise-grade encryption and anywhere/anytime reliability so you can be rest assured that your official data is secure regardless of the location of your remote worker. Check out our blog post on 12 Ways Office Chat Can Help You Embrace a Remote Working Culture. With the advances in new and innovative instant messaging solutions, there’s never been a better time to take ownership of your own organization’s communication and drive your productivity. It’s understandable that some retail firms will have reservations. But in order to provide your customers the best of the services, you will first have to empower your employees. And Office Chat can help you immensely with this.